Preheat oven to 400 F. Grease and flour muffin tins or use a nonstick cooking spray. Spray skillet with nonstick cooking spray. Saute onion for about 5 minutes until tender. In mixing bowl combine sauteed onion, corn, cheese, sour cream, oil, eggs and sugar. Add cornmeal mix and blend well. 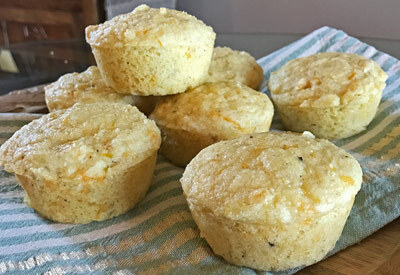 Fill the muffin tins 3/4 full and bake for 20 - 25 minutes. Remove muffins from tin and cool on wire rack.